Penguins!! 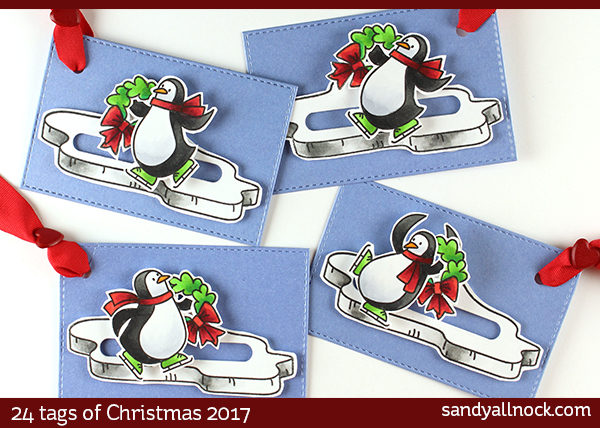 One of my tags each year seems to be an interactive one….this year it’s ice skating penguins! My recommendation is to buy the dies to make this; I didn’t and had to do a lot of fussy cutting. Even though I don’t mind the work – these could be done a lot faster WITH dies. Yep yep! Watch the video below or click HERE to see it in HD on YouTube. As is tradition, I’ll be choosing winners for each of the 24 tags made in these 6 videos – leave comments on the blog as well as on YouTube for more chances to WIN! Two styles, made with pretty patterned paper. Watch the video below or click HERE to see it in HD on YouTube. Bible bookmark supplies — paper and brads only! Check your local craft store. These are darling, and such a nice job you did on these little guys. What size is the tag? Love the sliders!! Such a fun tag for kids (and adults!). Love them! Whoa, these are special tags! I like to fussy cut, but not inside openings like the wreath has, or a coffee cup handle. I do love my dies, though! I’ve never done slider on a tag before…such a cute idea! My nephews would love this! You did a great job cutting those penguin by hand. Really beautiful tags! The sliders are a very fun idea! The kids will love these! Thanks for sharing! I love your tags. I would have bought the dies,I don,t like to cut them out by hand. Love these tags – great technique and super cute.